Cheese plate is a universal snack for all occasions. It will decorate any festive table and will be a complement for a modest meeting with friends over a glass of wine. Cheese plate from RussianFoodUSA is a platter of various cheeses, cut into slices. The most delicious cheeses - from the most delicate varieties to the most spicy. 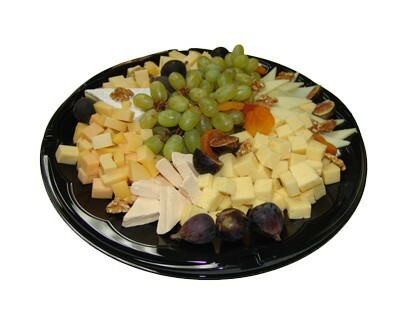 Properly composed and decorated cheese plate is suitable for any table and will be a great gourmet meal. In addition, the cheese plate is able to play an independent role, as in France, where cheese is usually served on a cheese plate as a mandatory dessert. Cheese plate can be a separate dish as an appetizer to wine. Also, it will be appropriate to serve pears, grapes, figs and honey to the cheese plate. Any cheese plate is perfect for wines! It is not necessary to go to a restaurant to enjoy this dish. You can order a cheese plate and complement your meal with excellent wine and good company. Blue cheeses are best served with cherries, pineapple or kiwi. Soft varieties well go with pears. Blue cheese also goes well celery. Figs (fresh and dried) and apples will be perfect to cheese. Nuts (almonds, walnuts, hazelnuts and pecans) can be served with any kind of cheese. Different types of cheeses jams are perfectly combined with different types of cheeses. In addition, you need to supplement the cheese plate with honey. Note that it must be liquid to dip cheeses in it. Do not forget about fresh bread. Here you can also provide guests with a choice, offering an assortment of baguette, rustic and bread with walnuts or dried fruits. Also a wonderful addition is the English crackers. Cheese affects to the taste of wine a much greater than wine affects to the taste of cheese.